You've heard all the, very slightly exaggerated, facts about Chuck Norris, like the fact that, when Chuck Norris does push-ups, he doesn't go up the Earth goes down, so here, for a change, are some facts about Chuck Norris that are actually true. Chuck Norris was born, Carlos Ray Norris, on 10th March 1940, so it’s happy 75th birthday Chuck Norris, tomorrow! Here are ten more real facts about the multi-talented martial arts expert, actor, screenwriter and film producer. Chuck Norris taught Steve McQueen Karate and it was Steve McQueen who encouraged Chuck Norris to follow a career in acting. McQueen and Norris were also good friends of Bruce Lee and they were both pallbearers at the funeral of Lee. Chuck Norris won the Professional Middleweight Karate tournament from 1968 through to 1973 and he holds the Golden Karate Lifetime Achievement Award. He hasn't lost a single fight since 1968 and his lifetime record is 10 losses, 2 draws and 183 wins. Norris is a politically conservative man and he is also a devout Christian. He writes a column for a conservative website, WorldNetDaily, he has written several books on the subject of Christianity and he is a supporter of the Republican Party. The only time that Chuck Norris has ever played a baddie, was in the film that made him a star, Way of the Dragon, with Bruce Lee. Other than that, he has always played the role of the good old American hero. Chuck Norris invented his very own martial art called Chun Kuk Do, which means "Universal Way." Chun Kuk Do is similar to Tang Soo Do and draws on elements of all the different combat styles that Chuck Norris knows. Unlike many of his movie counterparts, Chuck Norris really is a fighter, which probably explains that he is the one actor who is the subject pf spot many fantastic “facts”. He was the first ever westerner to achieve the rank of 8th Degree Black Belt Grand Master in Taekwondo and he also holds black belts in Tang Soo Do, Judo and Brazilian Ju-Jitsu. You can by your own jeans that were designed by Chuck Norris himself. Apparently they were designed by the actor especially to give him more movement when performing his stunt fight scenes. The brother of Chuck Norris, Wieland, was a private in the 101st Airborne Division and he was killed in action in 1970, while on patrol. Norris dedicated the films, “Missing in Action”, to his late brother. Chuck Norris was an Air Policeman in the United States Air Force and he served at the Osan Air Base, in South Korea. It was while he was serving in Korea that he first began his training in Tang Soo Do and it was also here that he gained the nickname of Chuck. 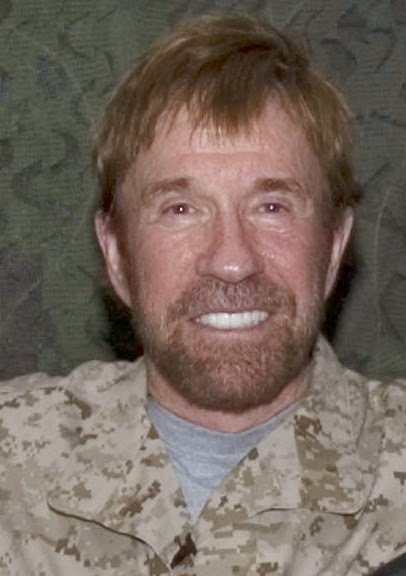 Chuck Norris was mad an honorary US Marine in 2007 and in 2010, he was also made an honorary Texas Ranger.